Cinnabunnies Recipe - refrigerated cinnamon rolls cut out in the shape of an Easter bunny. The perfect Easter morning treat! 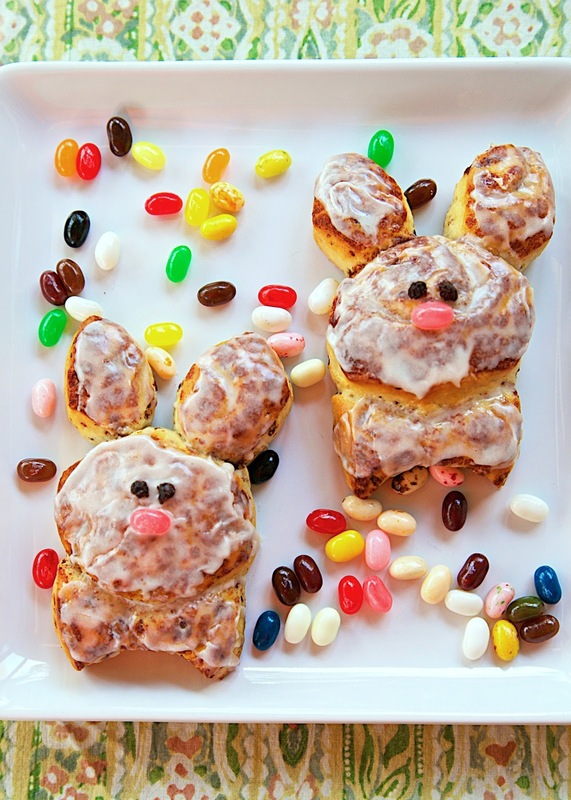 Easter is right around the corner and these Cinnabunnies are the perfect breakfast treat! The best part is there is only one ingredient! Growing up, my Mom would make an Easter Bunny cake with 2 round cakes. She used one for the head and cut the other one up for the ears and a bowtie. I thought, why not do this same process but with cinnamon rolls! Each Cinnabunny uses 2 cinnamon rolls. I decorated them with a jelly bean for the nose and a raisin for the eyes. I used a tube of regular Pillsbury cinnamon rolls - not the Grands cinnamon rolls. These Cinnabunnies are SO cute and SOOOO much fun to eat. We will definitely be having these again for Easter breakfast. Separate rolls. Place four cinnamon rolls on a baking sheet. Using a 2-inch biscuit cutter, cut 3/4 of an inch into each side of remaining rolls, forming ears and bow ties. 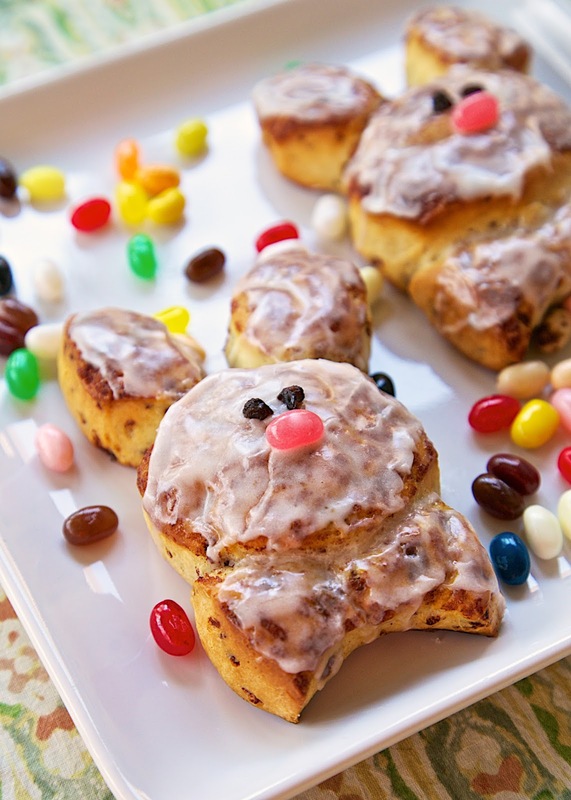 Add ears and bow ties to cinnamon rolls, pinching to attach. Bake according to package directions. Spread icing over warm bunnies. Place jelly bean in middle to make a nose. Cut raisin in half and use as eyes. Can also use mini chocolate chips for the eyes. Okay, I might have to make these for my daughter for Easter!! Super cute.